Connor Guy is a Spring 2012 Nation intern. He recently taught 8th grade English and Journalism in Las Vegas, Nevada through the Teach For America program, after graduating from Whitman College with a BA in English. Mexican poet and activist Javier Sicilia lost his son to a drug cartel. Now he’s part of a movement to end the drug wars. 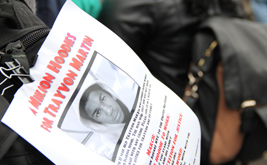 A thousand demonstrators gathered in Union Square to call for the prosecution of George Zimmerman, Martin’s killer. More protests are planned across the country.